This personalized monogrammed necklace is hand cut and polished out of 18 gauge (the lower the gauge, the thicker the piece, example: 18 g is double 24 g) sterling silver sheet and measures 5/8" in diameter. A script monogram is the perfect way to personalize any special occasion. 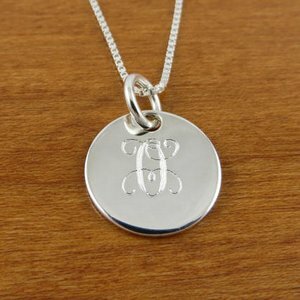 The silver monogram necklace and makes an excellent bridesmaids gift. Pendant comes complete with your choice of a 16', 18" or 20" sterling silver box chain and gift box.